The early spring heatwave has brought a taste of summer extreme heat and bushfires across the continent setting new early season temperature records with temperatures anomolies of 12 degrees C and more over much of southern Australia, particularly Victoria. This comes as a powerful El Nino is taking place in the Pacific which acts to boost temperatures and drought conditions in Australia. And all this takes place in a hotter environment with Australia having warmed by 0.9 degrees from 1910. In September the Climate Council warned that Australia faces increased bushfire risk, with bushfire seasons extending for longer due to the impact of climate change. The Bureau of Meteorology have issued a statement on October 7 which advises that the Indian Ocean Dipole has turned positive which will reinforce the El Nino impact on Australia. Climate model outlooks are examined very closely by the Bureau of Meteorology. Climate Prediction Manager, Dr Andrew Watkins, advised there has been a significant shift in temperatures in the Indian Ocean signalling a positive Indian Ocean Dipole. 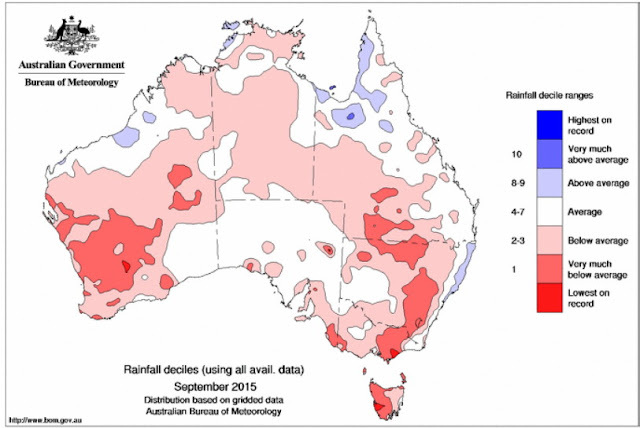 “Since we released the Climate Outlook, there has been a significant shift toward a drier October for much of Australia. It’s highly likely this is related to a rapidly strengthening positive Indian Ocean Dipole,” said Dr. Watkins. “We have been watching the waters to Australia’s northwest for signs of sea surface cooling that could reinforce the impact of the current strong El Niño. We are now seeing these signs, and their impact has been reflected in the most recent model outlooks for October. The Bureau of Meteorology issued Special Climate Statement 52 (PDF) on 8th October detailing that Victoria was particularly affected. The heat was most notable at a statewide level in Victoria. 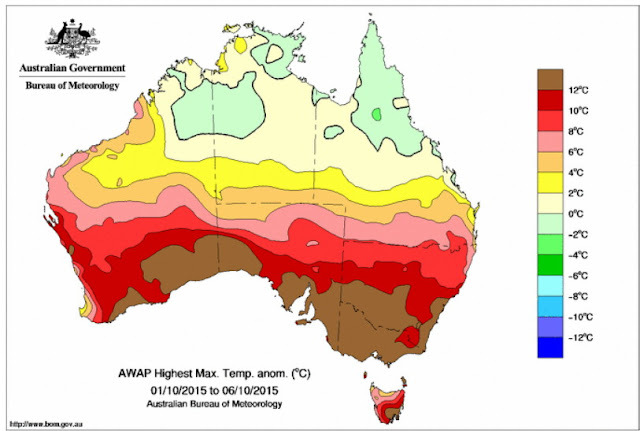 The five-day period from 2 to 6 October had a statewide mean maximum temperature of 30.69 °C. This is the second highest five-day mean maximum temperature for Victoria for any period in October (after 21-25 October 1914), and is an early-season record by a substantial margin. The hottest individual day of the period, 5 October (33.72 °C), ranks as the fifth-hottest October day on record for Victoria, and is also an early-season record. The highest temperature of the event was 42.3 °C at Eucla on 3 October. This is the highest temperature on record so early in the season for any location in southern Australia, surpassing the existing record of 41.5 °C at Moomba (South Australia) on 22 September 2003. State early-season records were also set in Victoria and Tasmania. Mildura reached 38.0 °C on 6 October, compared with the existing record of 37.4 °C, also at Mildura, on 22 September 2003; while in Tasmania, Friendly Beaches reached 33.6 °C on 6 October, surpassing the previous record of 31.1 °C from Hobart Airport on 27 September 1987. With over 200 bushfires catalogued in Victoria, this is one of the earliest onset for major bushfires in Victoria.